Century Center, 120 South Dr. Martin Luther King Jr. Blvd. 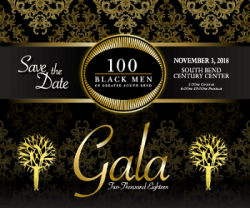 Program: 6 - 10 p.m.
Tickets for the 2018 Gala may still be purchased through Thursday, October 25, 4:00 p.m. at Lexus of Mishawaka (4325 Grape Rd.) or by calling 574-243-7700.